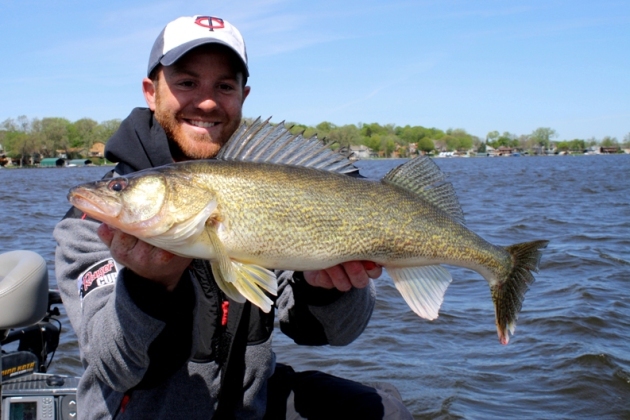 Travis Frank with an opening week walleye on Lake Minnetonka. Ice, cold, blah, blah, blah. I don't think anybody wants to spend time babbling about the cold spring. Instead, how about we take a look at what this cold weather will mean for the start of our fishing season? In short, I believe this cool spring will bring good fishing. Walleyes thrive in cooler water. Opening day might be slow, but it won't take long for things to heat up. The next month or two should be solid. In the metro, the walleyes are spawning as we speak. They spawn when the water is between 42 and 48 degrees. After the fish spawn, there is a heavy "feedbag" window when walleyes seem to eat everything in sight. The cool water keeps them active longer, and many times they remain in shallow, easy to find locations. I will be starting my season in the metro. Lake Minnetonka to be exact. I'm an optimist, so I believe we will find active fish come opening day. As of right now, the water temps are in the mid 40's and the walleyes are currently spawning. Come Saturday, we will be on the early fringe of their heavy feeding window. If it starts slow, it will only increase as we progress into the end of the first week. Here are some things that I will look for to help me find metro walleyes. First and foremost, I believe the walleyes will be shallow. I don't expect to fish any deeper than 7 feet of water. I'm going to search for the first green weeds of the year. Most metro walleyes are stocked fish. They spend the first year of their life in a small weedy pond. When transplanted, they go to what they know - weeds. The minute the walleyes finish their spawn, they go straight to the green stuff. Baitfish will use this area, and so will the walleyes. To get more specific, I believe the inside weed edges will hold the greatest numbers of active walleyes. On Minnetonka and a handful of other metro lakes, this weedline runs at about 3 to 6 feet of water.